Although it is only spring, consumers have "summer-like demand"
As gas prices climb, drivers are having to make sacrifices to afford fuel. "I'm kind of shocked right now coming to fill up," said Christina Standifird who stopped to refuel in Mission Valley Monday. "It was something I was not expecting today. It's way higher than last week even." 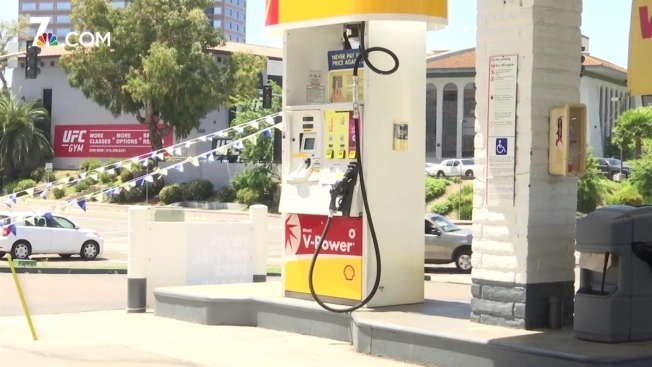 According to AAA, average gas prices in San Diego hit the $4 a gallon mark over the weekend. They are at $4.04 on average as of Monday morning. Gas prices in San Diego are up 20 cents since last week and 80 cents since last month, AAA said. Shell stations and 76 gas stations in downtown San Diego, Pacific Beach and Fashion Valley were sitting around $4.39 per gallon Monday. Gas price increases are primarily due to increased crude oil prices, ongoing refinery issues in California and summer-blend fuel in the marketplace. Summer-blend fuel costs more than winter-blend fuel because there are extra ingredients to prevent it from burning off in the heat. It costs an average of 15 to 20 cents more a gallon, which is felt by consumers. Of the major 10 oil refineries in California, six of them have closed recently due to scheduled or unscheduled maintance issues. "I'll have to travel less because the prices are so high," Standifird added. "I'll be watching gas prices more closely." But the price increases are being felt not just in California but all over the country. The prices are exceptionally high for this time of year, AAA added. Although it is only spring, consumers have "summer-like demand." "People are traveling for spring break and the economy is good," said Doug Shupe, Program Manager for AAA in Southern California. "So there's been a higher amount of travel compared to previous years." AAA has some tips conserve fuel and make your dollar go as far as possible. "Take the extra weight out of your car like those boxes of paper from the office or the golf clubs from last weekend," said Shupe. "It will help you get more gas miles the lighter load you carry." Shupe also suggests easing onto your gas pedal when the light turns green. AAA offers a free app for smart phones that gives local gas prices comparisons to consumers so that they can find the most affordable prices nearby.